Phoenix, Arizona (USA) – July 24, 2018 (travelindex) – Best Western Hotels and Resorts announced today that its SureStay Hotel Group franchise has reached yet another milestone – revealing the brand has over 100 hotels in its North American portfolio. This announcement underscores the brand’s overarching success, as it now has a total of 189* properties worldwide in less than two years since its launch, making it one of the fastest growing brands in the hotel industry today. SureStay Hotel Group’s accelerated growth can be attributed to a number of factors. 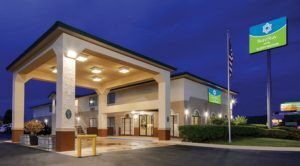 The brand has become known as a trusted and respected lodging option among travelers – offering travelers consistent and quality levels of comfort, cleanliness, and a service guarantee, all at an affordable price. The brand has also garnered significant interest among developers in the upper-economy/lower-midscale market because of its competitive fee structure and access to Best Western’s powerhouse brand. While the brand has certainly captured the attention of today’s travelers and developers, it’s also proved its ability to deliver impressive results in a short period of time. In fact, Best Western Rewards® revenue contribution for North American SureStay® Hotel by Best Western and SureStay Plus® Hotel by Best Western-branded properties is at 36.1 percent currently; Best Western’s reservations system, LYNX, has delivered 40.2 percent of bookings; and total brand contribution is 62.3 percent YTD (through February 2018). The majority of SureStay Hotel Group applicants are seeking to reposition and strengthen their existing hotel assets. Best Western conversions also comprise a large portion of SureStay Hotel Group properties. Comprised of three distinctive brands – SureStay Hotel by Best Western (classic economy), SureStay Plus Hotel by Best Western (premium economy) and SureStay Collection® by Best Western (lower-midscale soft brand) – SureStay Hotel Group’s rapid success can be credited to its unique, competitive fee structure and Best Western’s staunch reputation for enhancing the guest travel experience by providing real, consistent value and an industry-leading, return-guest loyalty program. The brand provides an easy path to hoteliers who are committed to providing a superior guest experience but wish to avoid the high investment costs mandated by most brand standards. Properties must maintain a minimum 3.5 TripAdvisor® rating, agree to a satisfaction guarantee and unannounced inspections. The brand’s focus is to: create consumer relevance and confidence through unprecedented quality and care; and produce developer value by offering fair franchise terms, a competitive fee model, best-in-class support and a connection to Best Western’s expansive scale – which is critically important in advancing hotels’ negotiating power and creating advantageous OTA terms.